As a reader of the long-standing series of novels by author Chelsea Quinn Yarbro that feature the always-urbane and fashionable Comte de Saint-Germain, I found inspiration in the Count’s continuing awareness of the sensuous and artistic possibilities of apparel and dress. 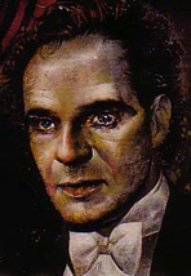 Saint-Germain, the hero of these novels, is an ancient vampire. However, instead of wishing to destroy living human beings or their civilizations, he has struggled to fit into society, hoping to live and interact peacefully with others. Saint-Germain has repeatedly used dress in his ongoing attempt to properly play his role, hoping that it can partially hide his apparent shortcomings or stigma (Goffman, 1959, 1963). Moreover, as an aesthete and sensualist, Saint-Germain has enjoyed fine and luxurious apparel, as can be seen in the fabrics, fibers and materials he has worn both for everyday and for special occasions, as well as his penchant for fine handwork and craftsmanship. In homage to this character and his remarkable knowledge and appreciation of fine apparel, I have created this clothing line for women. Combining hand knitting, crochet, and embroidery, these three pieces employ color, motifs, and fine fibers to reflect and illustrate his tastes. The first garment, “Native Soil,” is a sleeveless dress that includes a wrap skirt. The bodice of the dress is crocheted with a fine dark red merino yarn in the traditional feather and fan motif. The gently undulating shapes of this motif can suggest the silhouette of ancient mountains that have been worn down over time. The motif therefore references Saint-Germain’s original home (his “native soil”), which was deep in the Central European Carpathian mountains. The dark gray skirt is knitted in garter stitch with baby alpaca, a luxury fiber known for its softness. Red and gray are two colors that are important to the character throughout the book series: red refers not only to blood, but also to the rubies with which Saint-Germain often adorned himself. The color gray is also important to him. Before the advent of the automobile, he routinely chose perfectly matched gray horses to pull his carriages. The undulating nature of garter stitch and the use of front-post stitches in the dress’ straps are details that are a nod to Saint-Germain’s sensuous enjoyment of detail and texture. Outfit Two, “The Eclipse Device,” is a sleeveless dress crocheted in black and red yarn, both of which are 50% silk and 50% baby alpaca. On one shoulder, an embroidered version of Saint-Germain’s personal symbol, a stylized solar eclipse, is featured. The red circle at the center of the bust also refers to a solar disk. The eclipse motif obliquely refers to a vampire’s victory over the sun, as it were, since the sun is the source of all natural life on earth; Saint-Germain’s kind of life has no need of the sun. Throughout his long years, Saint-Germain was no stranger to the luminous shine of silk and often featured it what he wore. Black, the main color in this piece, was so much associated with Saint-Germain’s style of dressing that in past eras when men typically wore clothing as brightly colored as women’s, he was often pegged as a priest for his penchant for black. The third outfit, “Midnight Blue Enigma,” is a top and skirt. The crocheted top is composed of two light gray yarns: one of which is 75% mohair/25% silk, the other being 75% wool/25% stainless steel. It features kimono sleeves and a variety of crochet stitches, from half-double crochet to triple crochet. The skirt, in a dark blue merino wool, includes a knitted waistband and hem. The hem is knitted to feature another mountain motif. The body of the skirt is crocheted. The dark blue color is important in the Saint-Germain literature primarily because the character himself has unusually dark blue eyes, which are almost blue-black. Goffman, E. (1959). Presentation of self in everyday life. New York: Anchor Press.